For the 'first-light' images, ESA pointed Integral at Cygnus X-1. Cygnus X-1 is about 10 000 light years from Earth and one of the brightest high-energy emitters in the sky. 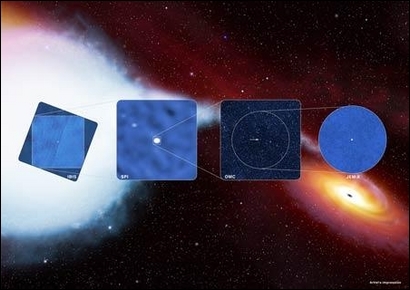 It was discovered in the 1960s and is thought to be a black hole, ripping its companion star to pieces. The companion star, HDE 226868, is a blue supergiant with a surface temperature of around 31 000K. It orbits the black hole once every 5.6 days. It is a well-known source of high-energy radiation and provided the ideal test location to fine-tune Integral's science instruments. Integral has four instruments that all point in the same direction so that they simultaneously observe the same celestial objects. They are the Imager on Board the Integral Satellite (IBIS), the Spectrometer on Integral (SPI), the Optical Monitoring Camera (OMC), and the Joint European X-ray Monitor (JEM-X). Simultaneous observation allows us to match their data, giving more insight into the nature of the celestial objects that Integral will be studying.